Home Tips	Southern Wedding Traditions…. Happy Monday, Everyone! With a mere 26 days to go until the wedding, plans are in hyper drive! Over the weekend my son and his fiance participated in a classic Southern Wedding Tradition! Burying a bottle of bourbon! Whenever folks begin preparing for a wedding, be it indoors or out, they pray for good weather. It seems like a good omen to have nice weather! So far, we have been super lucky as far as the pre-wedding festivities. For the engagement party in May, the forecast called for 80% chance of rain for the weekend. But, by Saturday, the forecast changed and it was a gorgeous, albeit hot day. And we were thankful! We rented a large tent just in case. But it was a perfect day! Here are a few pictures from the engagement party…. And the same thing for the bridal shower. The forecast didn’t look promising, but on the day of the party, the weather was perfect. A bright, sunny August day! The Paris-based theme was fun too! I must give props to my sister-in-law Shana for hosting this gorgeous bridal shower! It was beautiful and so much fun! And a little chandelier love…. And the gorgeous bride-to-be with her ribbon bonnet! However, some might argue that rain is a sign of fertility and good luck. One of my favorite weddings (Tiffany and Daren) was held in the pouring rain in September. The lovely couple took it all in stride and now have two beautiful children. So, at the end of the day, regardless of the weather, the ceremony goes off without a hitch and you are still married. And maybe with a fun story and an umbrella or two! But, all things being equal, we all hope for nice weather! So, a fun Southern tradition to ensure good weather for a wedding is to bury a bottle of bourbon at the wedding venue. Here are a few guidelines! 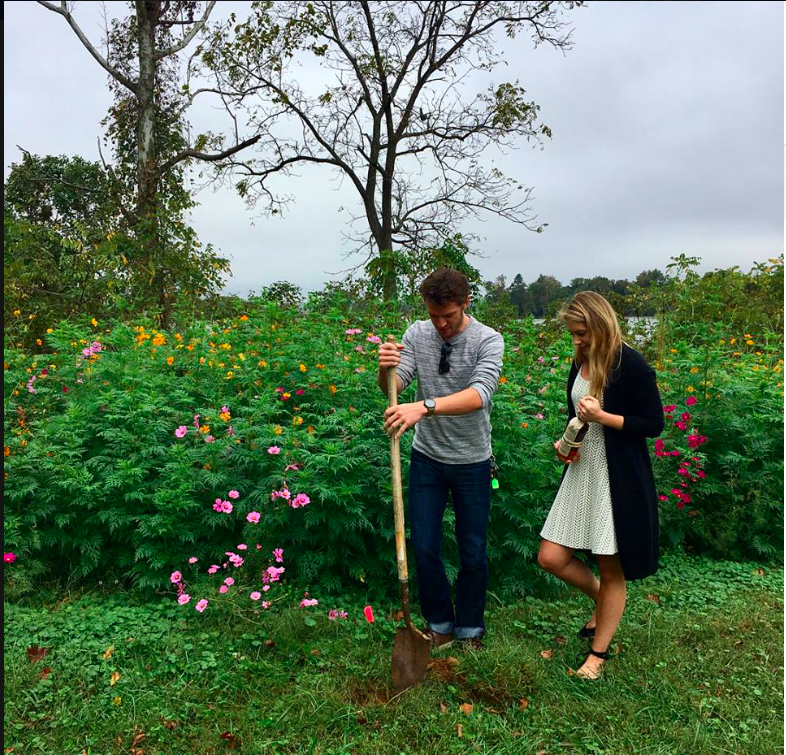 First, the engaged couple must bury the bottle upside down, one month prior to the wedding. The bottle must be unopened and preferably buried on a nice day, hopefully similar to a day you wish for. Here is my son and his fiance choosing the spot at their venue, the lovely Shirley Plantation in Charles City, Virginia. They buried the bottle this past Saturday. The weather was perfect and what a beautiful setting! The bottle of bourbon, is safely buried and ready for perfect weather on the wedding day in November! Fingers crossed! The legend says, on the day of the wedding, after the ceremony, the couple digs up the bottle and shares the bourbon with the wedding party. And hopefully on a nice dry day! I’ll let you know if it works!